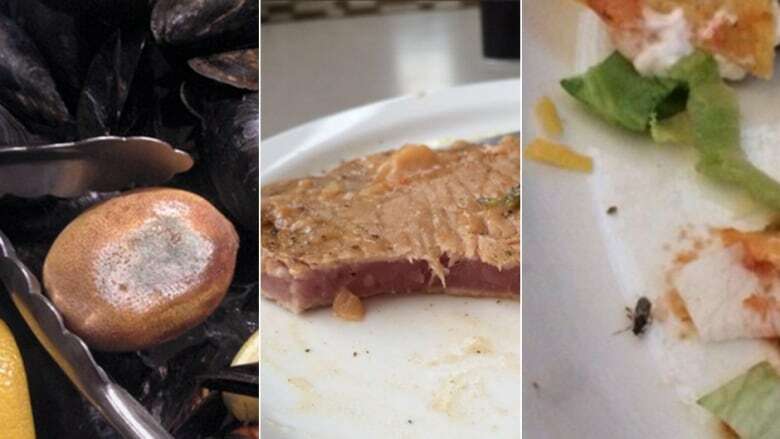 Students at Newfoundland and Labrador's Memorial University say the food they're being served on a meal plan mandatory for students in residence is frequently undercooked and rotten, and something needs to change. Students at Newfoundland and Labrador's Memorial University say they've had enough of what they call inedible food being served at the dining hall​. Mandatory meal plans for university students living in residence at the St. John's campus cost more than $2,000 per semester. "Hungry? Yes. Appetized? No. Excited? Absolutely not," student Lauren Moir says of the dining hall meals. Moir said multiple incidents Monday night of undercooked pork chops being served to students was "the last straw," and something needs to be done. "Isolated incident, that's OK, but it's happened so much that it's not an isolated incident anymore," she said. "We can't excuse something like this for the amount that we're paying." The food services at Memorial University are provided be Aramark, a company best known for providing food service in American prisons and schools. Unhappy students have posted on the MUN Dining Services Facebook page and other social media sites about their experiences with the dining hall, and one student compiled a list of complaints in an Imgur post. Student Erin Guilfoyle said that at first the food was fine, but quality has been steadily deteriorating. "Since September dining hall started I was like, 'This is not bad.' As the year went on though, incidents of raw chicken, raw fish, raw pork kept popping up," she said. "Why is this happening? Why is there rotten food? Why is there wilted lettuce at the salad bar every day? Why is there no fresh fruit? Since I'm paying over $2,000 a semester for this, I was just blown away by the lack of quality I was getting." Social media: helpful tool or unnecessary panic? According to Moir, she has seen multiple posts on various social media sites with students complaining about a specific incident with the dining hall — only to see that post deleted later on. In a screen capture of a post on the MUN Dining Services Facebook page from a local Aramark representative, the page outlines social media as "powerful mediums" that may not always accurately reflect the situation. "Almost every food related incident that has appeared on social media was never brought to the attention of a manager," the post from March 2014 reads. "[Facebook and Twitter] can unnecessarily amplify problems that could have been easily rectified." However, Moir said students regularly bring issues to staff's attention — and the list of sub-par food experiences can't be brushed off as social media hype. "The way I see it is, if you can really compile a list of multiple times that this has happened and multiple times their only response has been 'contact a manager, please take this off social media,' eventually it gets to the point that you can't keep doing that. It's not going to change." Officials with Memorial University told CBC News they met with Aramark managers Tuesday to discuss the Imgur post currently being shared by students, and a meeting with the student union is scheduled for later this week. A statement from Aramark head office states the company is conducting an investigation into the complaints.